Stacked washers and dryers are just as they sound -- two separate units stacked one on top of the other. These space-saving appliances are designed for narrow, tall areas and are sometimes connected along the sides and back. They are often used in apartments, condos, mobile homes and other small residences. Stacked washers and dryers save space. 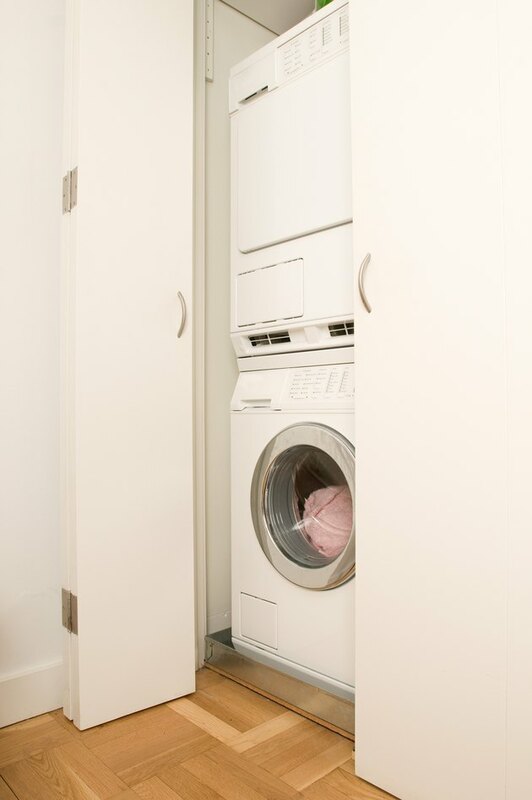 Stacked washers and dryers feature the washer on bottom and the dryer on top. Of necessity, they are front-loading machines, which use less water than top-loading machines. Stacked washers and dryers are available in full-size versions -- which are 27 inches in width -- or you can purchase smaller machines that have widths of 24 inches. Smaller units are easier to fit into most closet spaces. The life expectancy of stacked washers and dryers is the same as their non-stacked counterparts. In general, washers and dryers last an average of 13 to 15 years, according to a study published by the National Association of Home Builders. Of course, this can vary depending on how they are maintained. Dryers, for example, will wear out much more quickly if they are not kept clean of lint, as trapped lint can cause the units to overheat. The primary advantage of stacked washers and dryers is that they save space. Beyond that, one must consider the disadvantages. Your choice of models and extra options (such as steam cleaning) might be limited, as stacked washers and dryers must have controls only on the fronts of the machines, and the washer must have a smooth surface in order to place the dryer on top of it. In addition, to ensure a good fit and a long life, the machines should be purchased at the same time. Otherwise, one may wear out long before the other. Laundry centers are very similar to stacked washers and dryers in that they feature the dryer on top and the washer on the bottom. Unlike stacked washers and dryers, these units are all one molded piece, although each runs separately. In short, you cannot take them apart. They are not usually as large as full-sized machines. Washer-dryer combos are one machine that wash and then dry the clothes in the same tub. Critics say that these machines do not dry clothes as well as dedicated clothes dryers, according to the ConsumerSearch.com website. What Is the Minimum Depth for a Walk-In Shower?